John Flood's Random Academic Thoughts (RATs): Are Your Lawyers from Heaven or Hell? Are Your Lawyers from Heaven or Hell? Hat tip to Neil Rose for this. 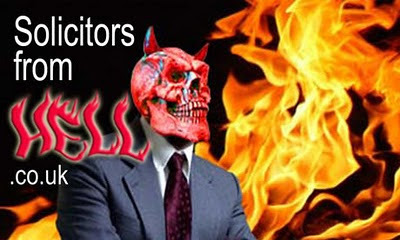 Solicitors From Hell is a website devoted to letting clients anonymously post or vent their spleen at the horrible things done to them by solicitors. There are 864 lawyers listed including both solicitors and barristers. Some are well-known names, others less so. But there is no doubting the anger of the complainants. The full list is here. The website is run by Rick Kordowski from Essex who found himself engaged with solicitors who wouldn't take his calls or talk to him. After the case was lost, he complained to the regulators and won £500 compensation. Thus began his list. As yet he appears not to have lost a defamation battle. You can read more about him and his website in this Independent article. To balance the equation, Rick has started a counterpart website, Solicitors From Heaven. It's a rather shorter, more anodyne site than the other. Necessary but not so much fun to read. I have been inspired by your blog to write one of my own and tell the world exactly what happened to me. It can be found here: http://bit.ly/a2rbTs Please come with me on this journey. Well worth reading for those in the legal profession the book written by Roland Bank's "THE LAW WILL ALL BUT WHERE'S THE JUSTICE"which could be a good debatable point, as you will find what happened to Roger Rabbit should never happen to anyone else, just click on this link! Solicitor is a person who advices client or needed people on the matter of law, writes down legal documents. He /she helps to solve the matter or problem with legally. The ABA Gets It Right and the LSB Doesn't?